I was approached by a gent who had found my work via the Internet and E-mailed me a short message outlining his idea for a painting. He has very kindly allowed me to use his Commission as example, and for that I extend a large Thank you to him - it follows the painting journey of his commission to share with those who may be looking to commission a bespoke piece of Art from me, and is interested to read about someone else's experience, hopefully this will give you a good insight into the Commission process. 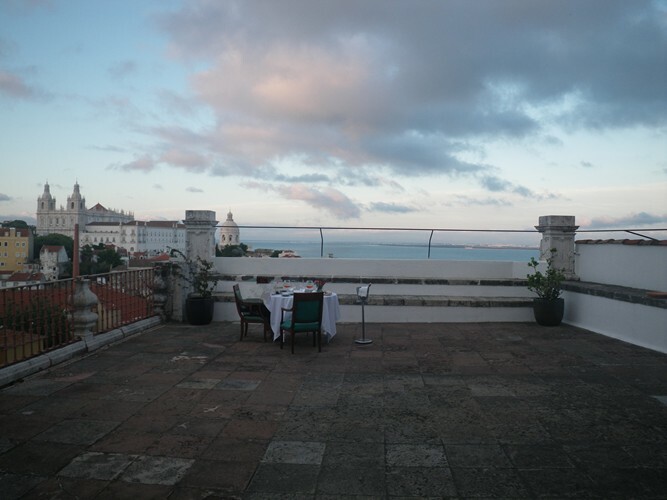 This was taken 'before' the event and the client preferred a sunset sky. 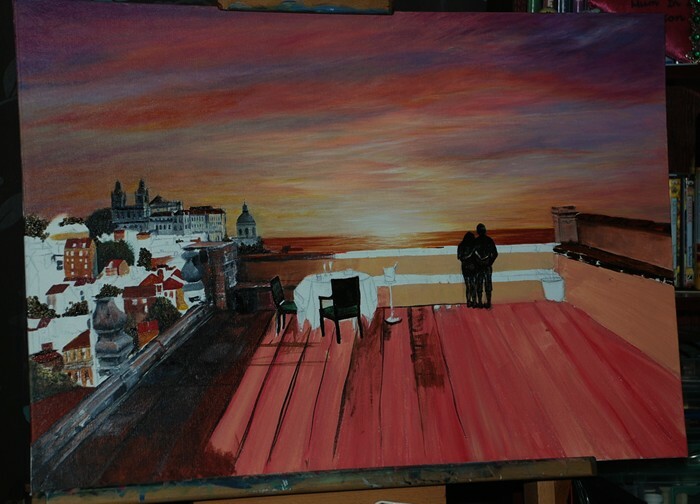 The client and his now fiance had been to Lisbon where he had proposed to her in a very beautiful and romantic setting and he wanted this very special moment of their lives recreated into a painting. He had an idea of how he wanted the painting to look, but was open to my thoughts and ideas too, so he sent through a collection of photographs from the evening. 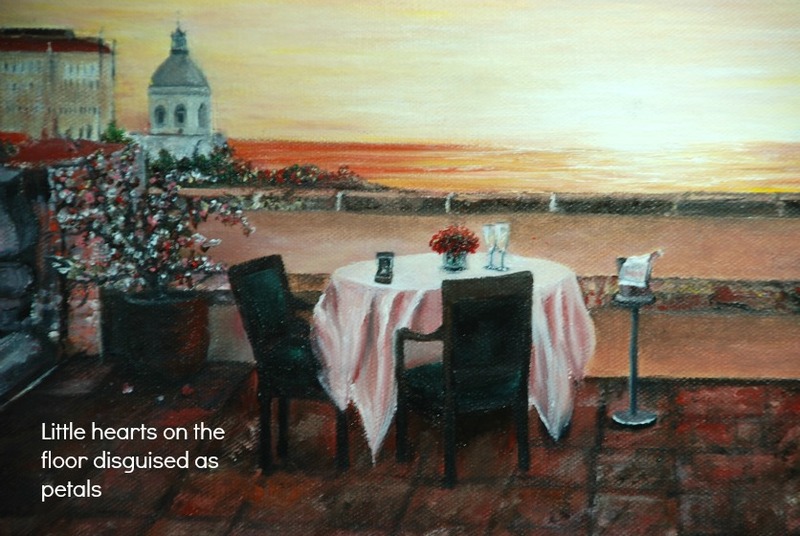 The whole setting included a stunning view from the terrace (left image) which was to be the basis of the painting. As this was going to be quite a complex piece, I began by producing a pastel sketch of the image to give a quick idea of scale, position and perspectives and then went on to 'building' the photographic image that I would then work from. It may appear to the untrained eye that many realistic pieces of Art have just been copied straight from the photograph, but this is very rarely the case - Artistic Licence is used as extensively by an Artist as 'Photoshop' is used by many great photographers and for those Artists like me, who use photographic reference to work from, most paintings will have been produced from at least 2 or 3 different images - in this case, I believe I counted a minimum of 11 different images all added to the one painting seen here. This commission is the most complex I have undertaken so far, yet have to admit that I thoroughly enjoyed the challenge - the hardest part was producing the 'photographic image' (seen left) before I even picked up a paintbrush! 1st - The original was tweaked in the following way by cutting, cropping and pasting other photographs together via a basic editing program. The colour tones of the image needed changing - warm tones were added, as were contrasts and shadows darkened - all these tweaks changed the 'cool' tones of the evening to create the 'warm' sunset tones seen on the 1st edited photograph. 2nd - 2 seperate sunset images were cropped and attached to the newly edited image - the pink and purple tones are one photograph, the sunset glow is a second - all these joins were then blended as a new image. 3rd - The table was cut from the composition and pasted back as a larger size so I could minimise unecessary & excessive space on the image. 4th - With all the details being mostly central, the image was cropped to a wider Landscape to allow these to be seen, so the size of the original canvas choice at 20" x 24" was changed to 18" x 26" at no extra cost to the client. 5th - A second image (2) was 'built', as the houses and buildings seen to the left of the original photograph, was a little minimal and did not reflect the beautiful colours of the roofs seen during the day - so another image was found, then cut and pasted onto the heavily edited mock up image - this was minus the railings so I could see all the details on the houses before I then painted the railings over the top using Image 1. 6th - A random couple image was cut and added to the image as the client wanted himself and his fiance to be in the image but had no photographs to send at that time, so the silhouette couple was added to give an idea of perspective to the whole picture. 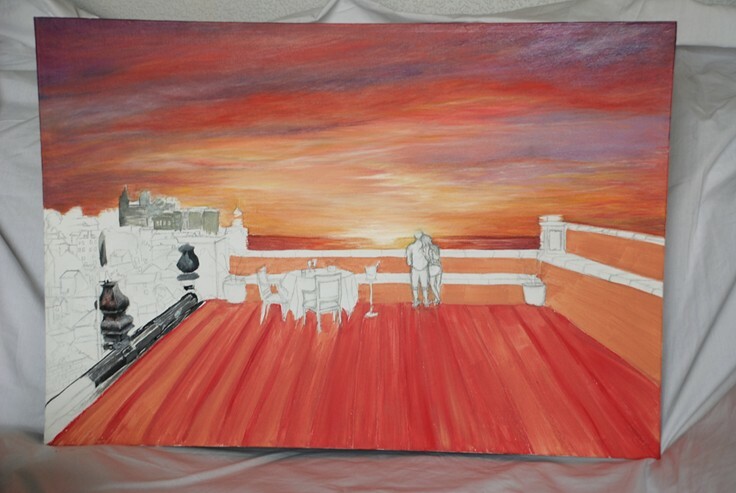 Actual images of the couple stood in the required poses were later E-mailed to me (his fiance had no idea of this surprise painting, and I was later informed that images were obtained with a few questions and odd looks!) 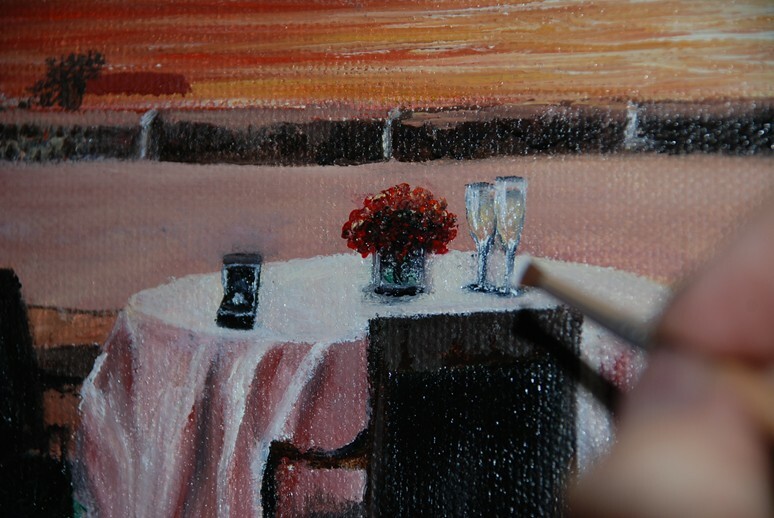 the dress that his fiance was wearing the evening of the proposal was added to the painting even though the reference photo did not have this clothing available - so that was a real challenge! 7th - Other images such as the engagement ring in box, flowers and champagne glasses were all taken from seperate images. 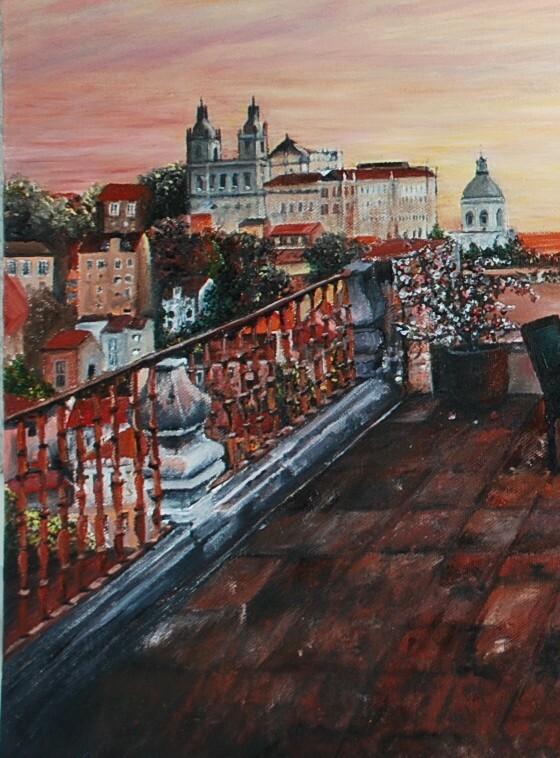 8th - The plants on either side of the terrace were just dark branches and would offer nothing to the painting. My first thought was, should I eliminate them completely but then decided that it would offer extra interest if I added some petals to the branches. Pinks, reds and white tones were added and included some little petals in the shape of hearts to the floor underneath. 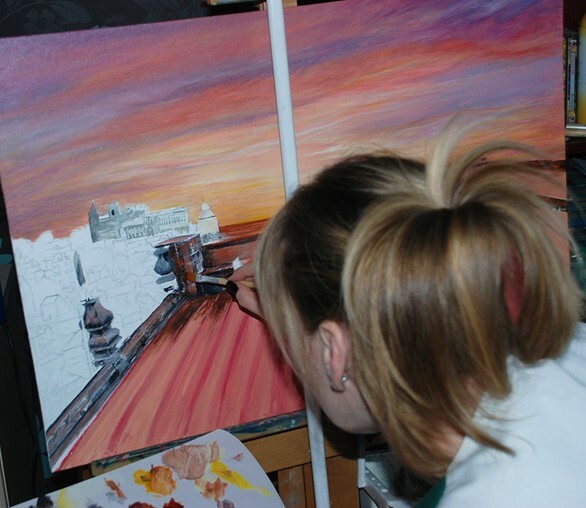 Getting started and out with the paintbrushes! After many E-mails and images had been exchanged between the client and I, once the final image had been accepted and the deposit paid, I finally began the painting. A secret page was set up so my client was able to follow the progress every step of the way and encouraged to contact me if anything on the painting did not look right, or something needed changing as the painting progressed - it is very important to me that my client is able to tell me if any changes are required throughout, and I always actively encourage them to do so without fear of embarrassment. Personal page with progress images posted every step of the way. Each image is interactive so you are able to view details up close. Just as I post progress images of other works and commissions on my ART NEWS page - I set up these pages up for clients who have commissioned me to produce a piece of Artwork as a surprise gift to someone, so they are able to follow the progress of their commission without fear of the intended finding it by accident. There is likely to be a few of these 'hidden' pages attached to this website right now - only the commissionee has the link address to view it and it gives them peace of mind whilst enjoying the progress show! Most of my Artwork is produced at night time and images are taken under artificial lighting, which darkens paintings slightly. Oil paintings also give out glare from 'wet' spots and I always stipulate these facts to the client in case they have any concerns. 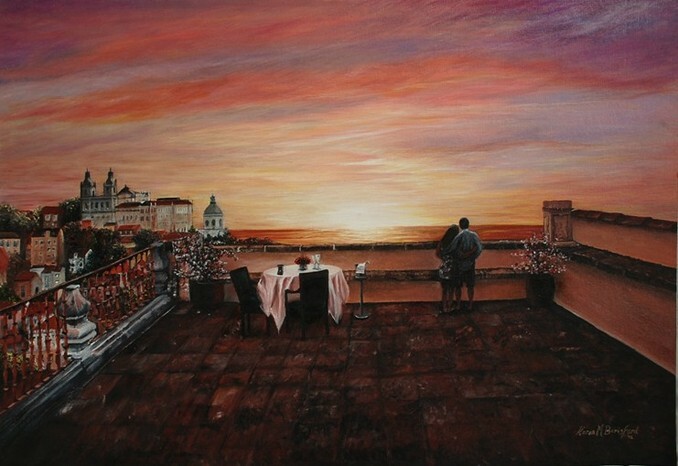 As with the second image below, this was taken during the day (but still adapted a shine to the top right of the painting) so the client is able to get a better idea of the tones and other details. 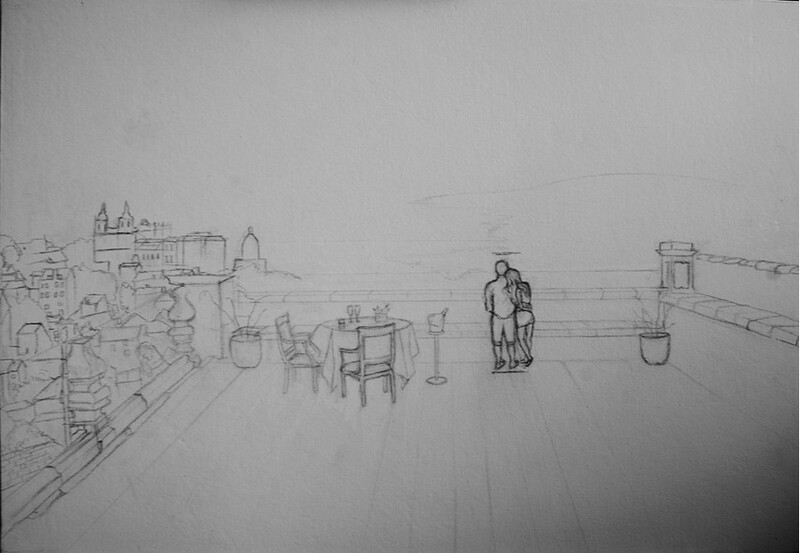 Upon initial outline and confirmation from the client - the painting in begun. Taken at night time - note the sky appears much darker than it actually is. Showing those small details difficult to see with the naked eye. 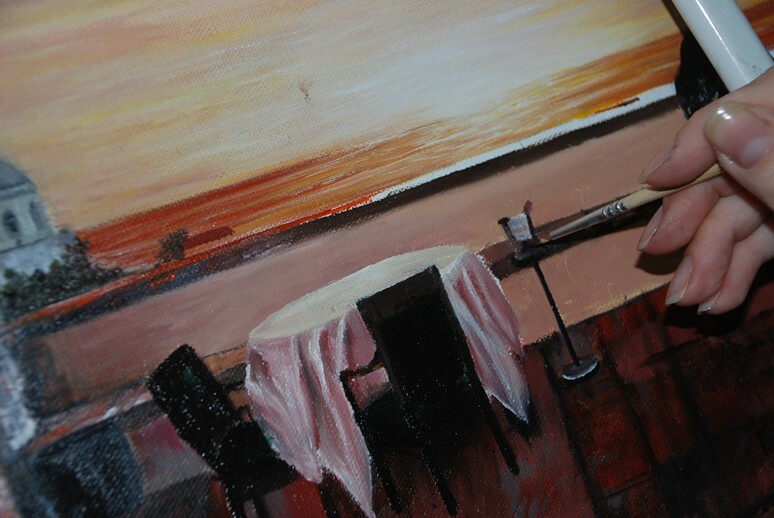 On completion of the painting, I contacted the client to inform them how long to expect before their painting could be sent out, and also for clarification before final payment is made - the Oil painting can then be left to dry and finally varnished - I like to give it around 2 weeks for it to dry before packing up and posting out. The images below are snapshots of different parts of the painting, so the client was able to take a close look before accepting the painting. It is at this stage that the client can request any changes to the Artwork, as once it is accepted and varnished, any changes that may be requested after this is not recommended.